"Green River Hot Springs Hotel and Sanitarium"
Part resort, part hospital, this may well have been the largest building in Kittitas County a century ago. Advertisements promised, "For those seeking rest of relaxation, there is no more pleasant place to visit. Orchestra plays at mealtimes and evenings with other diversions and amusements." Fire destroyed it not long after construction. 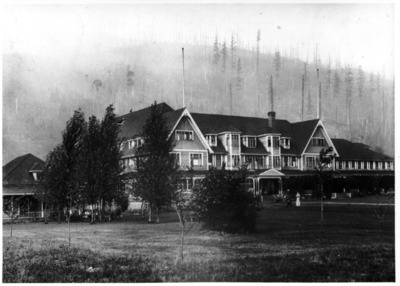 "Green River Hot Springs Hotel and Sanitarium" (1908). Ellensburg History Photographs. 262. Kittitas County (Wash.) -- Buildings, historic, Historic buildings -- Washington (State) -- Kittitas County, Green River Hot Springs Hotel and Sanitarium (Kittitas County, Wash.), Resorts -- Washington (State) -- Kittitas County, Health care facilities -- Washington (State) -- Kittitas County.